Hi folks! 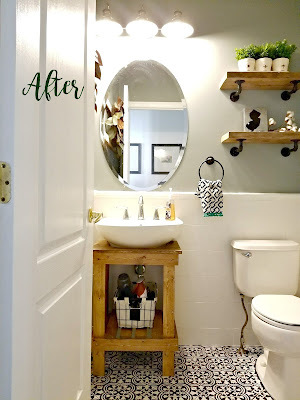 I'm sharing my cheap and simple rustic powder room details today. Our powder room was a neglected little place. The floor was dated and (like all projects I start) I decided to experiment. 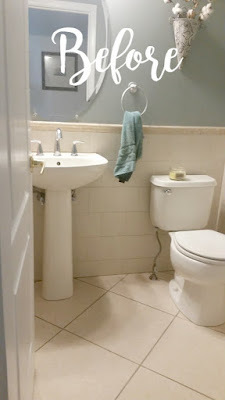 I wanted the floor changed and needed storage because we actually use this little powder room, a lot. I was determined to put a big band-aid on this room. 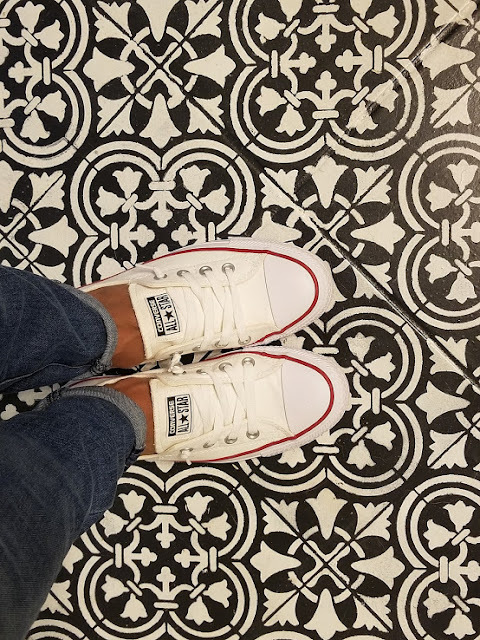 I admittedly wanted an excuse to try using a stencil on the floor like Susanna did at Livin' the Life of Riley blog. Check out her awesome results and how she painted her tile floor. 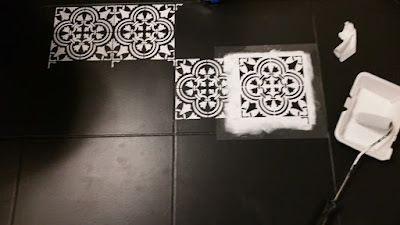 I ordered the same stencil from Cutting Edge Stencils; the Augusta Tile 12 X 12. 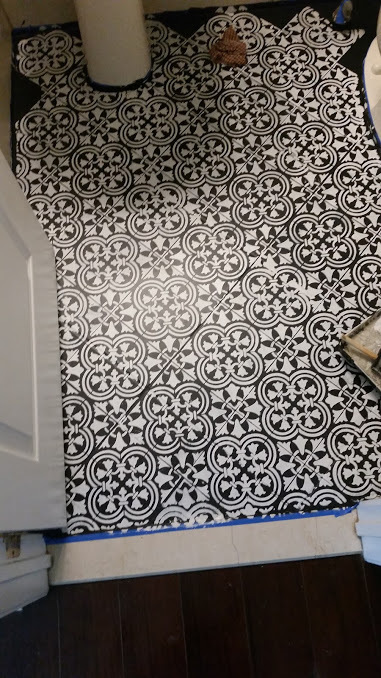 Our floor tiles were 18 X 18 so I had to just paint right over the grout and all. If you have smaller tiles it will line up for you. I'll spare you the tutorial, but Susanna used chalk paint. I just went with what I had on hand. I used Kilz primer first, then painted the floor with black porch paint (leftover from my staircase project way back when.) For the stencil, I used white Latex paint and sealed it with 3 coats of Varathane Floor Finish. Regardless of what type of paint you use, it must be sealed. That was the most difficult part, waiting to use the room, because I'm super impatient! I also painted the wainscot wall with Kilz and white latex as well. 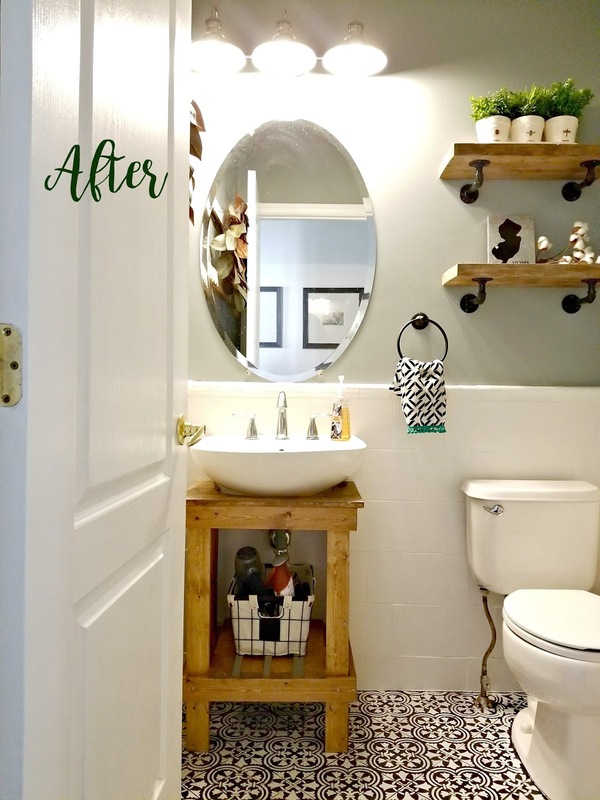 To add some storage, I searched high and low for a rustic vanity or pedestal sink surround that would accommodate a wall mount sink and wow, huge shocker, nothing existed. 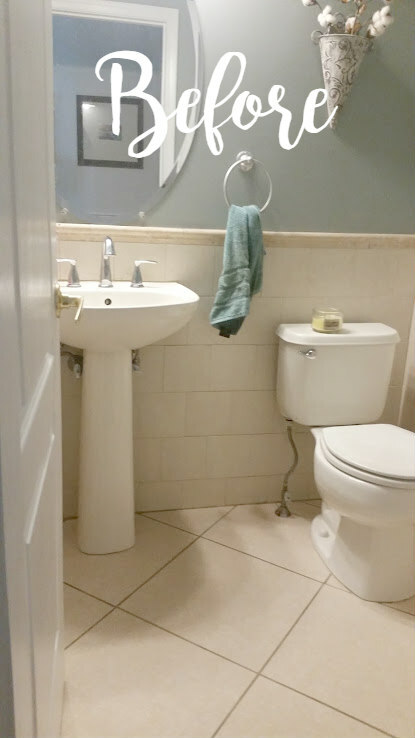 I was looking for simple here, and taking out that sink wasn't on my list. So I built one and some wall shelves with leftover reclaimed wood. I'll share the details on those soon.